Sweet tooth cravings are hard to ignore. Of course, mine always hit me around 9-10PM but luckily, I was perusing my Facebook news feed at the time when I saw a friend of mine had made Banana Ice Cream using only frozen bananas! Of course I had to try this extremely simple recipe! One ingredient ice cream?! It sounded too good to be true! But it wasn't...and oh how deliciously satisfying that ice cream was. Speak of the devil, here's your one ingredient! Frozen bananas! If you don't have any pre-frozen on hand you can take a couple off your ripened bunch and throw them in the freezer for 1-2 hours. 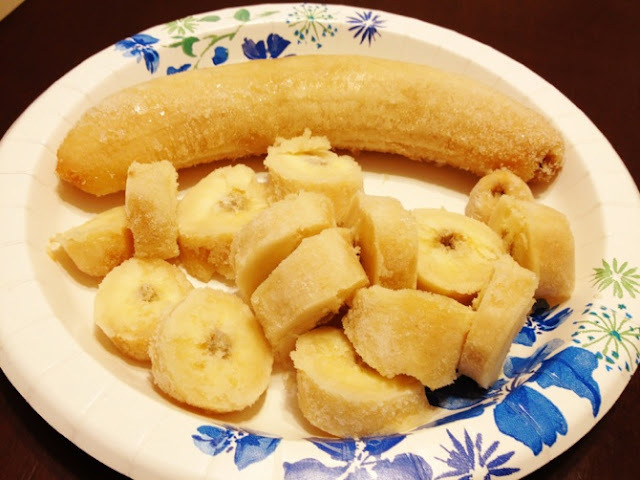 You should know though that frozen bananas are pretty tough to cut so you might want to pre-slice yours prior to freezing. I already had a bag of bananas sitting in my freezer so I used some kitchen shears to make my slicing a little easier. 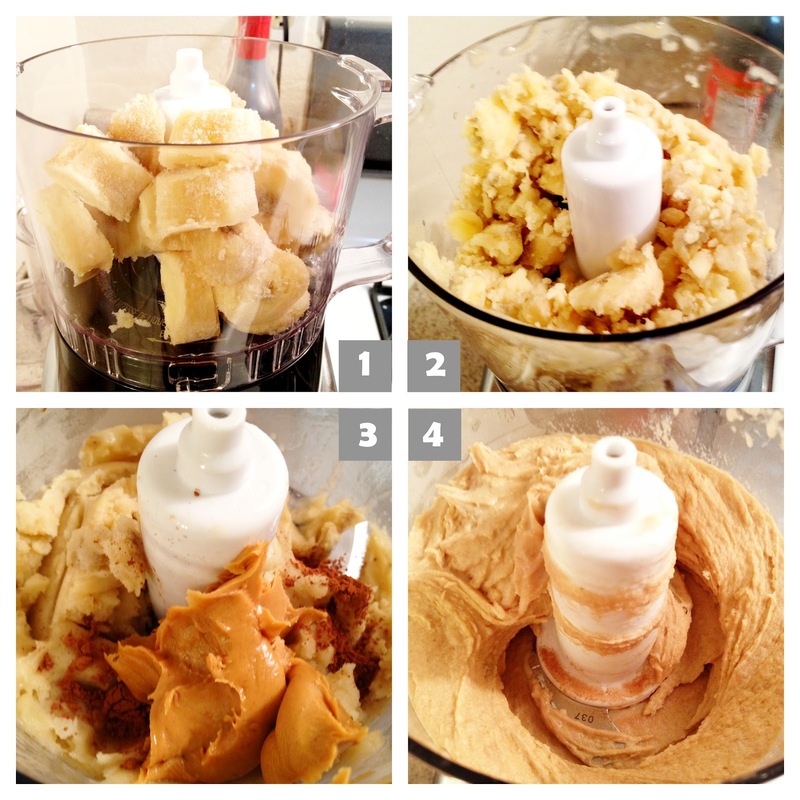 After your bananas are all frozen and chopped up, throw them in a food processor! My food processor is a blender duo so I had blender settings as well as a food processor setting but to get the chunky/grainy consistency you see in step two, use the food processor setting. It's going to take a few blends, stops and pushing everything back down with a rubber spatula until you get a icy creamy texture you see in step 3. Once you get to this consistency you can add in what ever other ingredients you want to flavor your ice cream with. 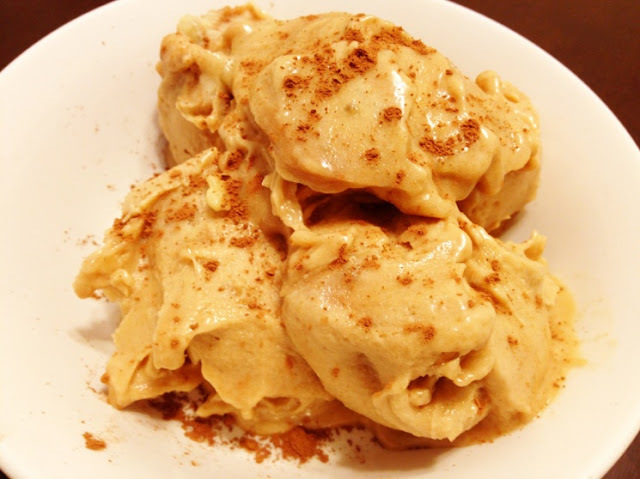 I used about a tablespoon or so of peanut butter and a teaspoon and a half of some cocoa powder. Give your creation one last blend to mix all that yuminess together and your final result is a soft serve consistency. If you want to be able to scoop it like ice cream I'd recommend putting your banana ice cream into an airtight container and freezing it for another hour or so to make it a little harder. I still can't believe how much this tasted like real ice cream! It's great if you're looking for a lighter alternative to your favorite sweet treat. I think next time I'll throw some dark chocolate pieces and walnuts in for a mock Chunky Monkey treat!